Homes in Paro, Bhutan were wrapped in white after the first snowfall in 2017. Image by Puran Gunung via Facebook. Used with permission. Many Bhutanese were taken by surprise on March 11 when they woke up and saw that most parts of the country were covered in thick blankets of snow. Light snowfall is common during late December and January in the mountainous northern districts of Bhutan, especially above 3,000 meters, but elsewhere in the country it's a rarer sight. 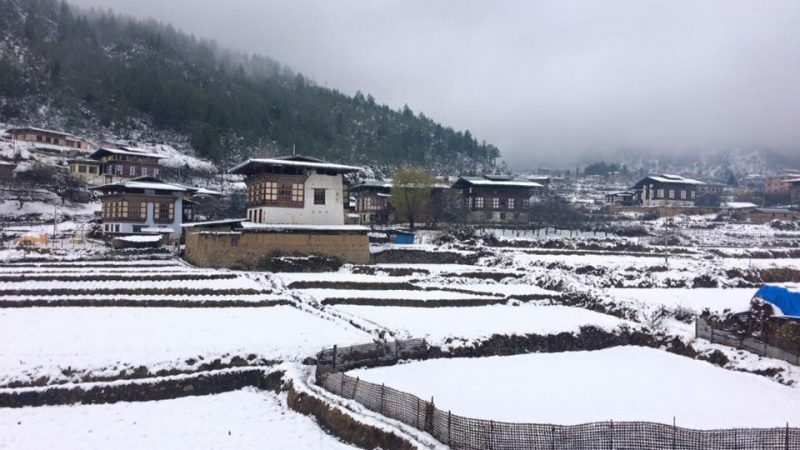 Given that spring is around the corner and Bhutan hadn't experienced any of the white stuff since Losar New Year at the end of February, the snow was unexpected for many. For places like the Bhutanese capital Thimphu, it was their first snowfall after many years. Other cities like Paro received one of the heaviest snowfalls of the past decade. The Bhutanese king declared that all schools and government offices will be closed to celebrate the snow. Soon Facebook and Twitter feeds were flooded with snapshots of the whitened landscape. Remarkable Day of GROSS NATIONAL HAPPINESS in Capital Of Bhutan ! “In Capital of Bhutan, Today, Snow was falling, so much like stars ,filling the dark trees, that one could easily imagine, its reason for being was nothing more than prettiness , the snow was too light to stay, the ground too warm to keep it. And the strange spring snow fell only in that golden moment of dawn today, the turning of the page between night and day. My fellow Friends, Consider as normal phenomenon In GNH Country, with no abnormal craziness, excitement, but enjoy, respect, and rest your day with full HAPPINESS”. However, not all was happy news. The snowfall also created much havoc in travel. There were some accidents and highways like the east-west highway and the Paro-Haa highway remained closed due to heavy snow. Breaking: Due to heavy snow and poor visibility RSTA advises people not to travel on Phuentsholing-Thimphu and East- West highway. Snow-filled Paro International Airport. Image by Puran Gunung via Facebook. Used with permission. Paro Airport, the sole international airport of the Kingdom of Bhutan, is considered one of the world's most challenging airports with surrounding peaks as high as 5,500 meters (18,000 feet). 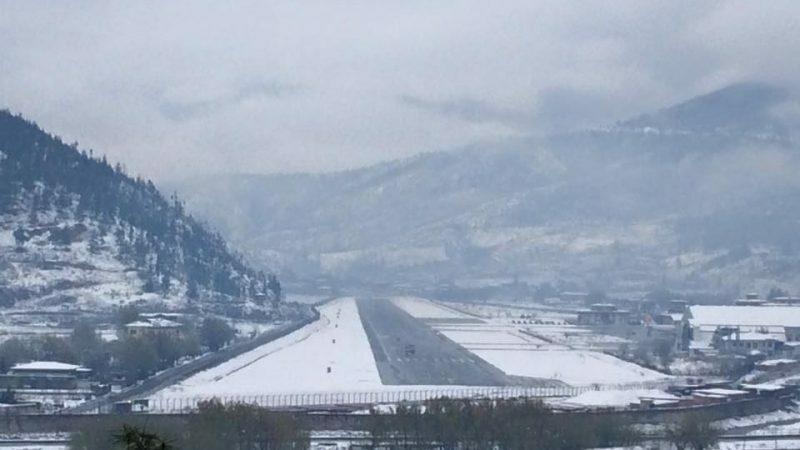 Power connections were disrupted for many hours in many cities and all flights were cancelled as the Paro International Airport remained closed. Despite the hassles the snow caused, people from all walks of life had fun with the snow, including making snow sculptures. 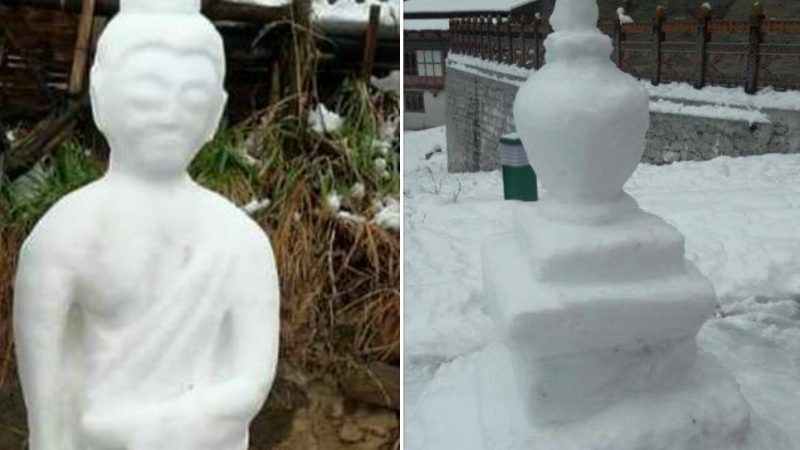 In Bhutan, they aren't snow men, but snow Buddhas and stupas. Image by Puran Gunung via Facebook. Used with permission. In recent years the Himalayan range has been receiving less snowfall, more rains and hotter summers due to global warming. Environmentalists are worried about the melting glaciers in the Himalayas. The weather in Bhutan is predicted to clear up starting Tuesday.